VR (Virtual Reality) has become the hottest topic around the world in these two years with the development of Virtual Reality technology and VR headsets. More and more VR devices such as Oculus Rift, HTC Vive, PlayStation VR, Samsung Gear VR, Google Cardboard, etc are released to meet different levels of requirement for customers. However, the VR videos does not spring up like the devices, so you may wonder if you can convert the normal video to VR format. In this situation, you may need a VR video converter which can help you converting VR videos. 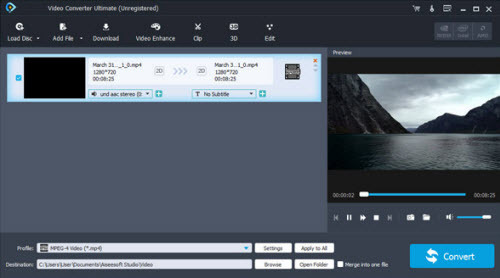 If you are looking for the best VR converter to help you to convert non-VR to VR formats to make 2D videos with 360 degree perspective, super three-dimensional and immersive experience or change a Virtual Reality video format or resolution to be available to VR video players,UFUSoft Video Converter Ultimate would be your best choice. The best VR video converter to convert 2D videos to Virtual Reality videos with great quality. Support downloading VR videos from streaming sites like YouTube, etc. Edit and enhance 2D normal videos before converting to VR videos. 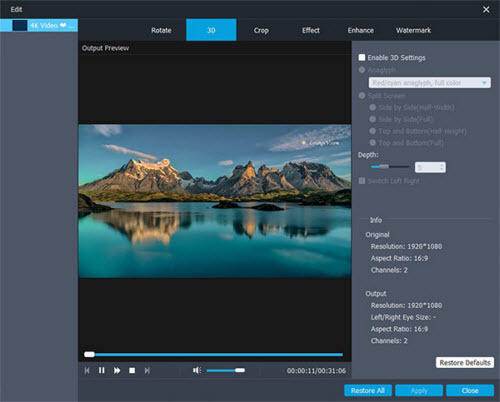 Convert even 4K/1080p videos to 3D/ VR formats without quality loss. How to Convert 2D to VR videos with VR Converter? In order to change the normal videos to VR format, you need to first download the best VR converter to start the conversion. After installing Video Converter Ultimate, click the icon to launch this VR converter software on your computer. If you are using Mac, you just need to download the Mac version. Click “Add File” button on the top toolbar of the main interface and add the videos you try to convert to VR videos into the program. Here you can see the general information of the added videos like name, size and length. You can add more than one audio tracks to the video or add subtitle also. Note: If you want to edit the videos before converting to Virtual Reality video, you can click the “Edit” button to enter the edit window. Click “3D” button on the top toolbar to enter the 3D window. Check the “Enable 3D Settings” box and choose the 3D mode you want from Anaglyph (Red/cyan), Side By Side (Full), Side by Side (Half-Width), Top and Bottom (Full), Top and Bottom (Half-Height). Then click “Apply” to back to the main interface and click “Convert” button to convert video to VR. VR (Virtual reality) is a computer technology that replicates an environment, real or imagined, and simulates a user’s physical presence and environment in a way that allows the user to interact with it. Virtual realities artificially create sensory experience, which can include sight, touch, hearing, and smell. The 360-degree video that capture the entire scene around the camera is not the same thing as VR. When playing the 360-degree videos/photos in a VR headset, you can look around and feel immersive in the scenery but not able to interact with it. Compare with 360 degree video, VR video is still in its infancy now. Here you can check the following list of the hottest VR headsets and its related VR formats. How to Play DAV Files on iPhone 8/8 Plus? How to Edit WMV Files on Windows 10 or macOS Sierra? How to Easily Play Dahua Video (*.DAV) Files on Mac OS X?